In May 2017, Sens. Bernie Sanders (I-Vt.) and Patty Murray (D-Wash.), along with Reps. Bobby Scott (D-Va.) and Keith Ellison (D-Minn.), introduced the Raise the Wage Act of 2017, a bill that would raise the federal minimum wage in eight steps to $15 per hour by 2024. Beginning in 2025, the minimum wage would be “indexed” to median wages so that each year, the minimum wage would automatically be adjusted based on growth in the median wage. The bill would also gradually increase the subminimum wage for tipped workers (or “tipped minimum wage”), which has been fixed at $2.13 per hour since 1991, until it reaches parity with the regular minimum wage. 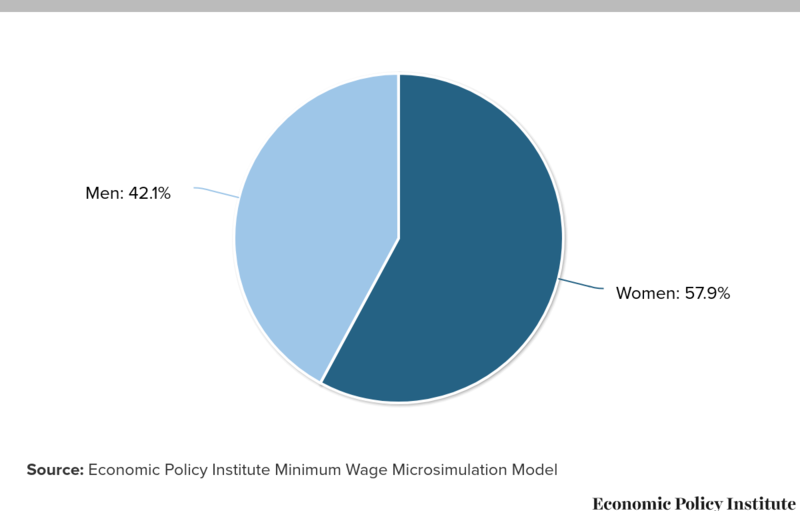 While raising the minimum wage would benefit both women and men, it would disproportionately raise pay for women. 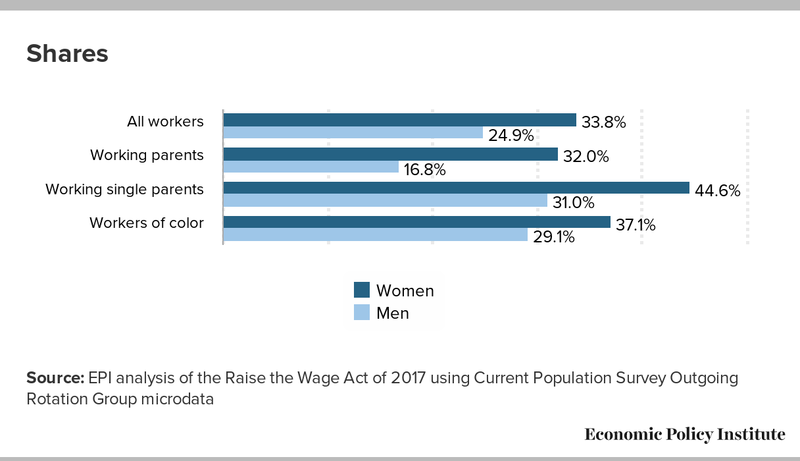 Although men make up a larger share of the overall U.S. workforce, the majority of workers who would be affected by raising the minimum wage to $15 by 2024 (55.6 percent) are women. 23.1 million women, or 33.8 percent of the female workforce, would receive higher pay if the minimum wage were raised to $15 by 2024. 31.5 percent of white working women (12.7 million white women) would get a raise. 43.1 percent of black working women (4.0 million black women) would get a raise. 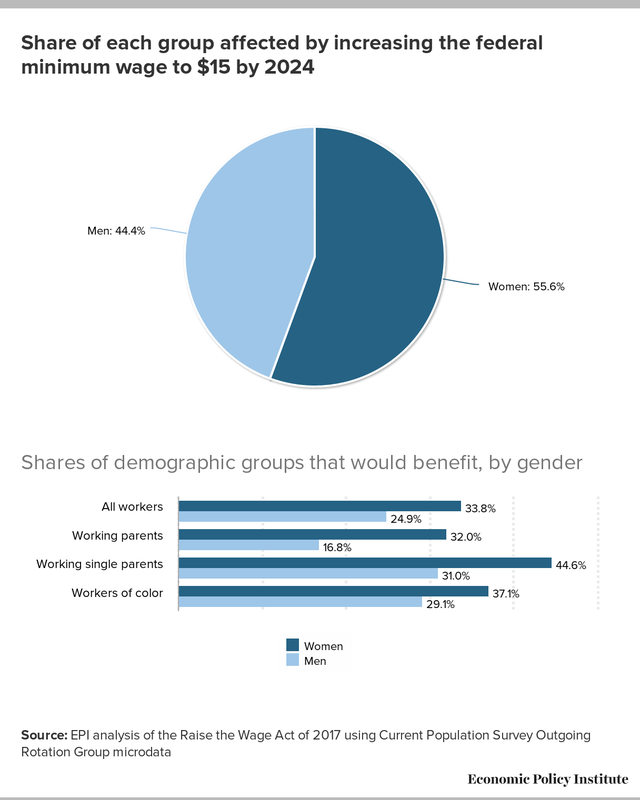 38.4 percent of Hispanic working women (4.6 million Hispanic women) would get a raise. 20.4 percent of Asian working women (1.0 million Asian women) would get a raise. Over 11.6 million working parents would receive higher pay under a minimum wage increase to $15 by 2024. Nearly a third, or 32.0 percent, of working mothers (7.6 million) would receive a raise (as would 16.8 percent of working fathers). Children would benefit too: nearly one-quarter of children (19 million children) have at least one parent who would get a raise. Of the 11.6 million working parents who would receive a raise, 4.5 million are single parents, accounting for 10.8 percent of all the workers who would be affected by a raise of the minimum wage. Among single parents, the effects of the increase are more dramatic than for parents overall: 44.6 percent of all working single mothers (3.6 million) would receive a raise if the federal minimum wage were increased to $15 by 2024 (as would nearly a third—31.0 percent—of working single fathers). Tipped workers—whose base pay will gradually be raised to the regular minimum wage—are predominantly women (66.6 percent) and disproportionately young; however, the majority are at least 25, and more than a quarter are at least 40 years of age. 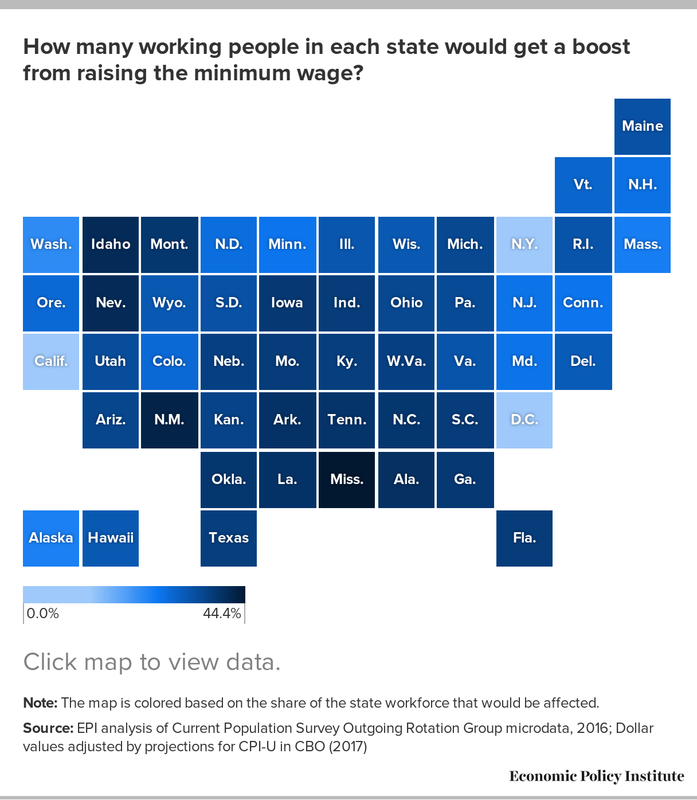 How many working people in each state would get a boost from raising the minimum wage? Note: The map is colored based on the share of the state workforce that would be affected. Notes: Values reflect the result of the proposed change in the federal minimum wage. Wage changes resulting from scheduled state minimum wage laws are accounted for in the simulation. Totals may not sum due to rounding. Shares calculated from unrounded values. Total estimated workers is estimated from the CPS respondents who were 16 years old or older, employed, but not self-employed, and for whom a valid hourly wage is either reported or can be determined from weekly earnings and usual weekly hours. Data and figures in this fact sheet are drawn from David Cooper, Raising the Minimum Wage to $15 by 2024 Would Lift Wages for 41 Million American Workers, Economic Policy Institute, April 26, 2017, with the exception of data about tipped workers, which draw from Sylvia Allegretto and David Cooper, Twenty-Three Years and Still Waiting for Change: Why It’s Time to Give Tipped Workers the Regular Minimum Wage, Economic Policy Institute, July 10, 2014.